179 London Road, Calton, Glasgow. 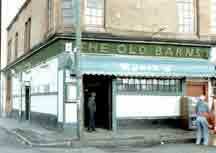 This is the oldest established pub in the city of Glasgow dating back to the 1600s. However the original Old Burnt Barns was demolished and this pub stands in it's place. To read the full history of the Old Barns click here. Exterior view of the Old Barns, August 2005. Interior View of the main bar with the late John Lynch the proprietor. This photograph was take just two weeks before he died. Many will remember him as a generous man. He was like Dellboy from the East End, I met him many a time in various auctions in and around Glasgow, he always went away with something. He told me "You should come along and see the treasure's I've picked up over the years." He must have had an Alladin's cave somewhere. I will miss John as we always had a good chat about the old days in the Calton the Gallowgate and the Barras. R I P.
Various view of the interior of the Old Barns. 2006. 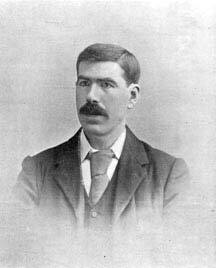 Mr Patrick McVey, manager of the Old Barns at the turn of the 1900s. Fifteen men were being held in custody by Strathclyde Police last night following two bomb blasts in public houses in Glasgow on Saturday night. They were arrested by armed members of the Special Branch and Strathclyde serious crime squad yesterday in dawn swoops in various parts of Glasgow. The men can be held for 48 hours under the Prevention of Terrorism Act and police can then apply to the Secretary of State for Scotland to hold them without charge for a further five days. Police confirmed yesterday that explosive devices were used in the blasts, and they believed they were related and were the work of an extremist group. The incidents brought a warning to the public from Chief Constable Patrick Hamill of Strathclyde Police to "display the utmost vigilance in licensed premises for any suspicious package, parcels, hold-all or the like which is unattended." In this statement, Mr Hamill said: "Management and staff of Licensed premises, and in all instances where suspicious objects or articles are observed the police should be noticed immediately." Police inquiries into the blasts, at the Old Barns public house in London Road, Calton and the Clelland Bar, Hospital Street, Gorbals, were continuing last night, and a special mobile police station was set up outside the Clelland Bar. The bomb in the Old Barns public house went off in a lounge bar, which is being redecorated. No one was injured. In the Clelland Bar, however, five people were treated in hospital for cuts caused by glass from the juke box, fruit machine, and windows, and a hole was blown in the floor. The licensed trade last night backed up the chief constable's appeal to the public. A spokesman said: "We want people to co-operate fully with the police. Anyone who sees anything remotely suspicious should tell the bar staff to contact the police, even if it does turn out to be innocent." Neither of the bars involved in the blast is sectarian, but those arrested are believed to have connections with the Ulster Defence Association. Two week ago at Paisley 24 men, believed to be associated with the UDA, were charged under the Prevention of Terrorism Act. Police are believed to have taken possession of weapons and explosives during raids on houses in Ayrshire and Renfrewshire.